Take Action: Fund Progress, Not Nukes. "The recently-passed energy bills in both the Senate and the House contain forward-thinking provisions like a Renewable Electricity Standard and increases in fuel economy. But they could also open the door for unlimited funding for dangerous and costly nuclear energy technology. 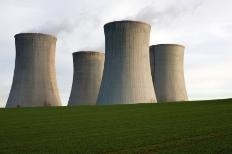 Nuclear energy is a bad investment, from outrageously huge subsidies to potential meltdowns to toxic waste that continues to accumulate without any permanent storage facilities. Take action now and urge your members of Congress to remove this provision that would give the nuclear industry a blank check to build new nuclear reactors across the country." -- A Sierra Club "Take Action" request. There are better, smarter, safer, healthier, sustainable energy alternatives such as solar, wind and geothermal the we should be supporting instead. Tell your Senators and Representative to Refuse Unlimited Loan Guarantees to the Nuclear Industry!